You’ve got more toys than you know what to do with. Half of them your kids have either grown out of or grown bored with. You have friends and family asking what your kids want for Christmas. You tell them they do not need any more toys and, actually, they have plenty of clothes too. The thought of finding a spot for more toys makes your stomach turn. You’re already thinking of ways to make it work because they will inevitably get more toys. 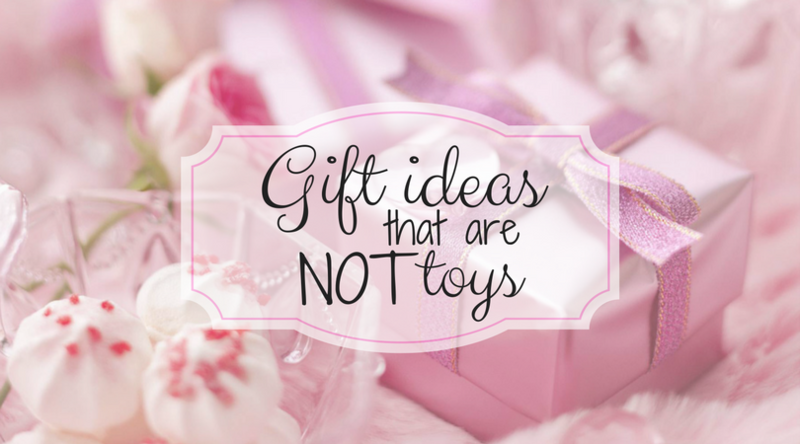 So today I’m sharing a list of gifts that are NOT toys that will hopefully spark a few ideas for the little ones in your life. If your family lives close to a zoo, a membership is a wonderful idea. I wish so bad that we lived closer to a zoo because we would definitely make use of a membership, however the closest for us are Birmingham or Nashville. If you’re like us and not close enough to a zoo to make use of a membership, day passes for the family is another great idea. I’ve stated before that our membership to the Huntsville Botanical Garden and our carousel passes (both gifted to us last year for Christmas by our families) have been our favorite thing this year. We would not have been able to visit the garden nearly as much this year if we had to pay every time we went. Same as above. We ride the carousel just about every time we go to Bridgestreet and would not have had the opportunity to do this as often if it weren’t for the passes. We love the new Let’s Play facility in Huntsville. Raley asks to go all the time. They have a frequent pass where you can get 10 visits for a discounted price. If there is an indoor play area similar to Let’s Play in your city, check and see if they do anything similar. *If a membership is above your budget, a day pass to any places like these are always great too. The parents of the children you are buying for would definitely appreciate being able to take their kids to play without having to worry about paying admission. *These are geared more toward older kids. What is the child interested in? Has she been asking to ride a horse? Has he been wanting to learn to golf? Maybe he’s a baseball player wanting to improve his skills. Or she’s a cheerleader wanting to learn new tricks. Maybe a few lessons are the way to go. This could allow them the opportunity to learn something new or improve upon something they already love doing. It could also be very beneficial for them down the road. Magazine subscription – My friend April got Raley a magazine subscription for her birthday and she was so excited when it came in the mail and had HER name on it. It’s fun and educational. Sports gear – Ball glove and bat, a set of golf clubs, soccer ball and goal, tennis racket, etc. *These are a few ideas that kids will enjoy and can also be very useful. If you’re still looking for ideas for Christmas this year, I hope you will find this list helpful when shopping for the little ones on your list. (Be sure to pass it along to your family and friends as a hint!😉) Have a blessed and wonderful holiday season!